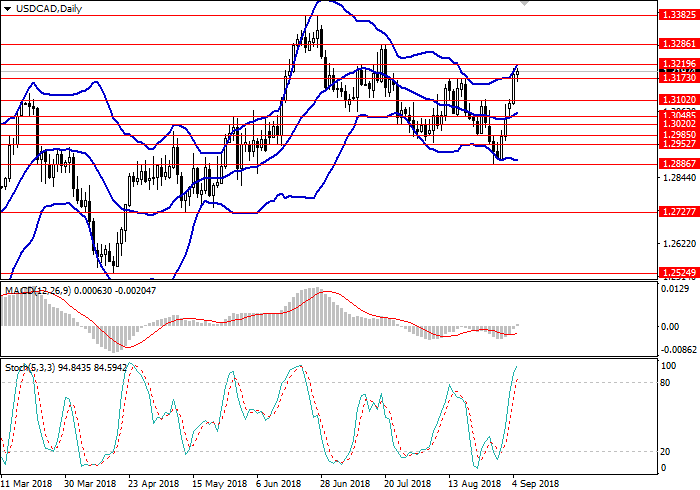 Yesterday, USD strengthened against CAD due to positive background data: Markit Manufacturing PMI reached 54.7 points, exceeding the forecast by 0.2 points, and ISM Manufacturing PMI rose to 61.3 points against the expectations of the fall to 57.7 points. CAD is under pressure of Canadian Manufacturing MI data, which was below the forecast and amounted to 56.8 points. Today, negotiations between the United States and Canada on the NAFTA trade agreement should resume, however, the positive result is not expected soon. Today’s key event for the pair is the announcement of the Bank of Canada's interest rate decision at 16:00 (GMT+2): it is assumed that the regulator will leave the rate unchanged at 1.5%. The market predicts high volatility. On the 4-hour chart, the instrument grows along the upper border of Bollinger bands, the price range is extended, which indicates a possible continuation of the upward trend. MACD histogram is in the positive area, keeping a confident signal for the opening of long positions. Resistance levels: 1.3219, 1.3286, 1.3382, 1.3400. Support levels: 1.3173, 1.3102, 1.3048, 1.3020, 1.2985, 1.2952, 1.2886. Long positions can be opened from the current level with the targets at 1.3286, 1.3382 and stop loss 1.3155. Short positions can be opened at the level 1.3100 with the target at 1.2985 and stop loss 1.3155.